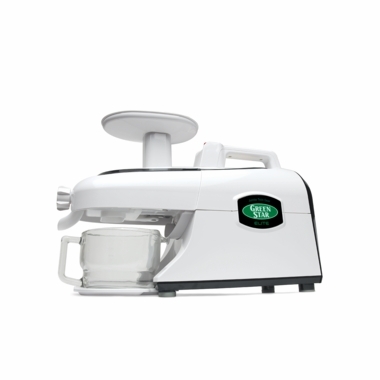 An upgraded version of the ever popular Green Star Juicer from the house of Tribest, the Green Elite juicer will let you savor juices the way they are meant to be savored� full of health benefits and rich in nutrients and taste. Its unique, natural-inspired design extracts juices just like your teeth do so you enjoy the goodness and essence of your favorite fruits or vegetables in its natural form. The powerful jumbo twin gears, which are inspired by natural grinding mechanism, reciprocate the way human teeth break down the pulp, or food, and ensure maximum natural content in the extract. The Tribest GSE-5000 Green Star Elite Juicer does not only look fabulous in its new avatar, but has a lot of added features to brag about. The compact, lightweight, and streamlined design allows easy moving and storage. It does not engage a large area of kitchen table or island, and hence perfect for any kitchen irrespective of its size. It�s quite easy to assemble or dissemble the machine with the new locking system, which uses removable turning knobs. 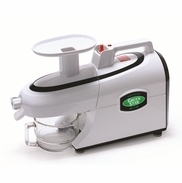 This one-snap step offers optimum convenience while assembling or dissembling the juicer. 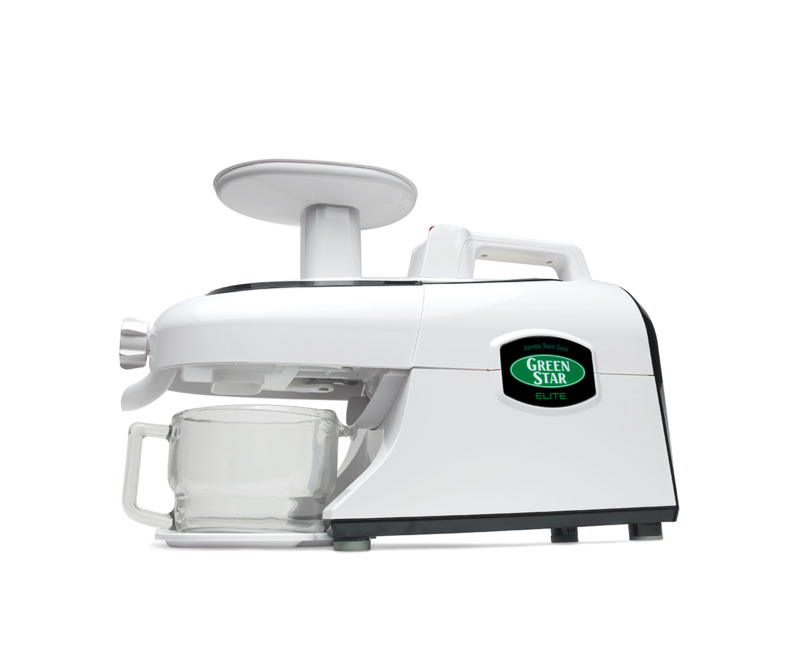 The design of the Green Star Elite Juicer is clutter-free and simple, and with lesser parts, meaning there are lesser parts to clean �it�s achieved by combining smaller parts into a single unit. The new easy-grip knob has been redesigned and features easy grip ridges so you can easily control the pressure inside the machine according to the feed. This not only helps you extract maximum out of the fruits and vegetables, but also allows you to juice a wide variety of them. The addition of mixing process in between the crushing and pressing makes it easier juicing soft fruits, besides making the machine more versatile. I was worried the GSE would be very hard to clean based on reviews I've read. I didn't find it especially difficult, and today was the first time I've used it. The cleaning is on a par with my centrifugal juicer. Snapping all the parts back together probably took an extra 3 minutes, but I'm sure I'll get faster with practice. Cukes, kale, celery and cabbage were really easy. Carrots and beets require more force. It wouldn't be fun to juice loads of carrot juice in this juicer. 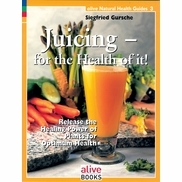 But, since I juice primarily greens, and just a few hard root veggies, this juicer suits me very well. The taste and color of the juice is so much better than what I got out of the centrifugal juicer. There was very little foam as well. And, it's a very clean operation. I don't get the pulp splatter all over the kitchen, which I always got with the centrifugal. Excellent juicer in every way. Quiet, maximum juice extraction and a vegetable and fruit screen so you can juice everything in this one machine. This is a great home juicer. One of the finest. I've only used it a few times, and it's much better than lower cost juicers. Juices greens easily, something vertical auger juicers have hard time with (don't have to cut the greens). One has to push the produce at time, but that's not a big deal. Large apples and like have to be cut to fit by width, not a big deal. Great for a home juice station. Harvest essentials was beyond fabulous!!!! I ordered my Green Star Elite juicer and it arrived in a few days. It was packaged perfectly protected!! I LOVE this juicer!!!! I will but from them again!!!! I give them 5stars any day!!! Thank you Harvest Essentials I will be ordering from you again soon!! We've had this excellent juicer for about a year now. No problems. Everything works as advertised. It makes the best juice ever. I'll never be without one again. I highly recommend this juicer. Brushes for cleaning and other accessories are easy to order and obtain. This is truly a high quality juicer worth every penny I paid. You won't be sorry. Buy one and do yourself a favor.